Veterans Memorial Park. —. The informational plaques located at the military equipment in Veterans Memorial Park were dedicated on Veterans Day, November 11, 2017. Our sincerest thanks to all who have served our country. 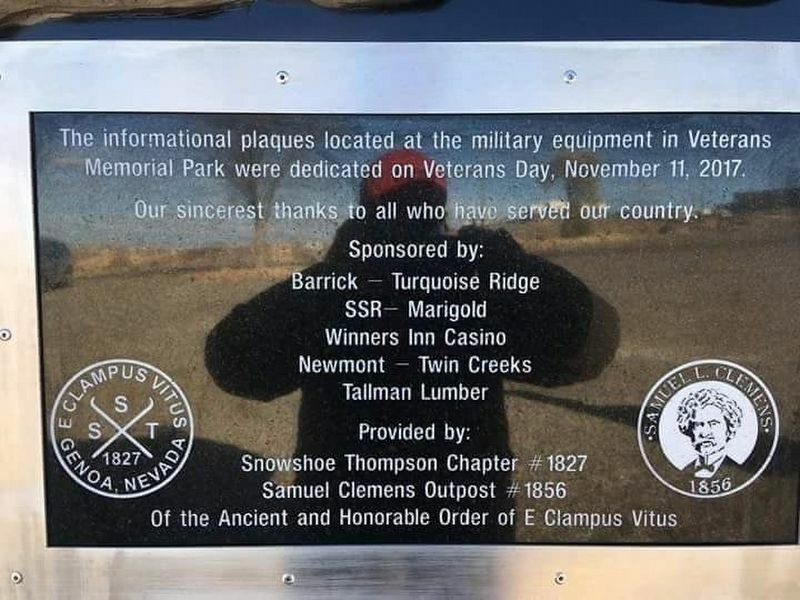 The informational plaques located at the military equipment in Veterans Memorial Park were dedicated on Veterans Day, November 11, 2017. Erected 2017 by Snowshoe Thompson Chapter #1827 Samuel Clemens Outpost #1856 Of the Ancient and Honorable Order of E Clampus Vitus. Location. 40° 59.414′ N, 117° 44.317′ W. Marker is in Winnemucca, Nevada, in Humboldt County. Marker is on Veteran Memorial Highway, on the right when traveling south. Touch for map. Marker is in this post office area: Winnemucca NV 89445, United States of America. Touch for directions. The Japanese Type 38 artillery gun was used beginning in 1905, and although obsolete was active through the end of WW2. The Type 38 designation was given to this gun as it was accepted in the 38th year of Emperor Meiji's reign. 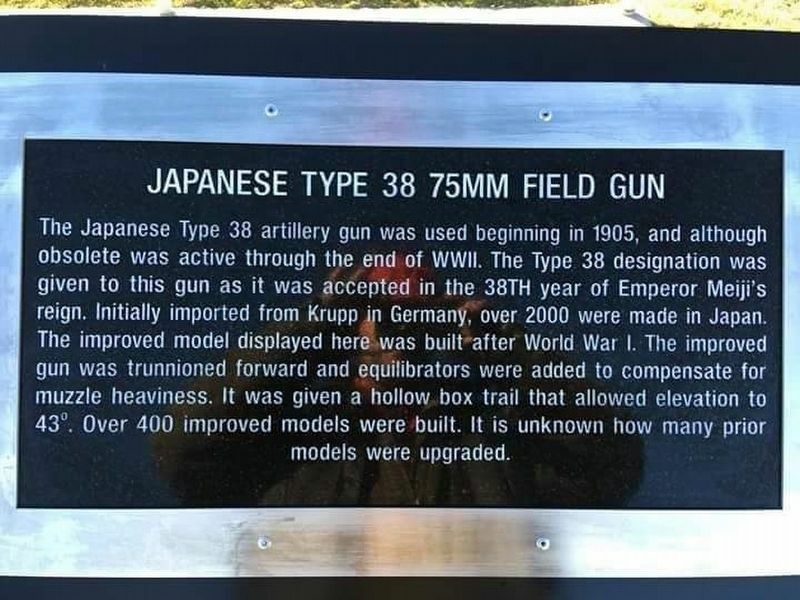 Initially imported from Krupp in Germany, over 2000 were made in Japan. The Improved model displayed here was built after World War I. The Improved gun was trunnioned forward and equilibrators were added to compensate for muzzle heaviness. It was given a hollow box trail that allowed elevation to 43°. Over 400 Improved models were built. It is unknown how many prior models were upgraded. (approx. 0.8 miles away); Winneva Building (approx. 1.1 miles away); California Trail - Trading Post (approx. 1.2 miles away); Winnemucca to the Sea Highway (approx. 1.2 miles away); Butch Cassidy's Wild Bunch Bank Robbery (approx. 1.2 miles away); a different marker also named Humboldt Canal (approx. 1.3 miles away); Winnemucca World War I American Legion Honor Roll (approx. 1.3 miles away). Touch for a list and map of all markers in Winnemucca. 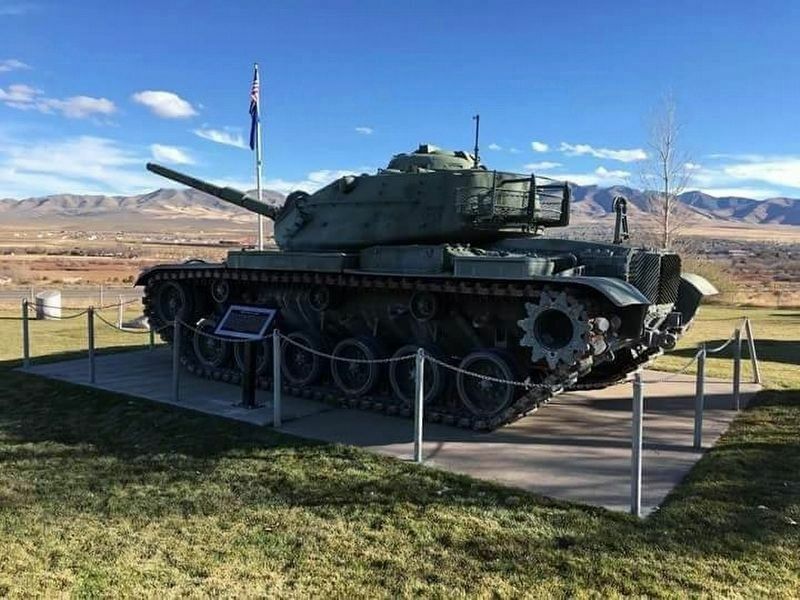 The M5A1 was equipped with two .30 caliber machine guns, a 37mm main gun and a .50 caliber anti- aircraft machine gun. 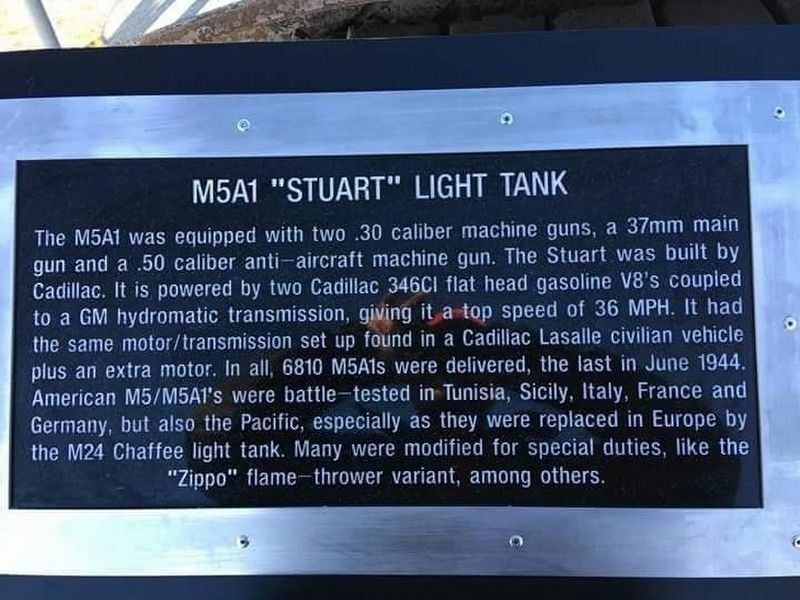 The Stuart was built by Cadillac. It is powered by two Cadillac 346CI flat head gasoline V8's coupled to a GM hydromatic transmission, giving it a top speed of 36 MPH. It had the same motor/transmission set up found in a Cadillac LaSalle civilian vehicle plus an extra motor. In all, 6810 M5A1s were delivered, the last in June 1944. 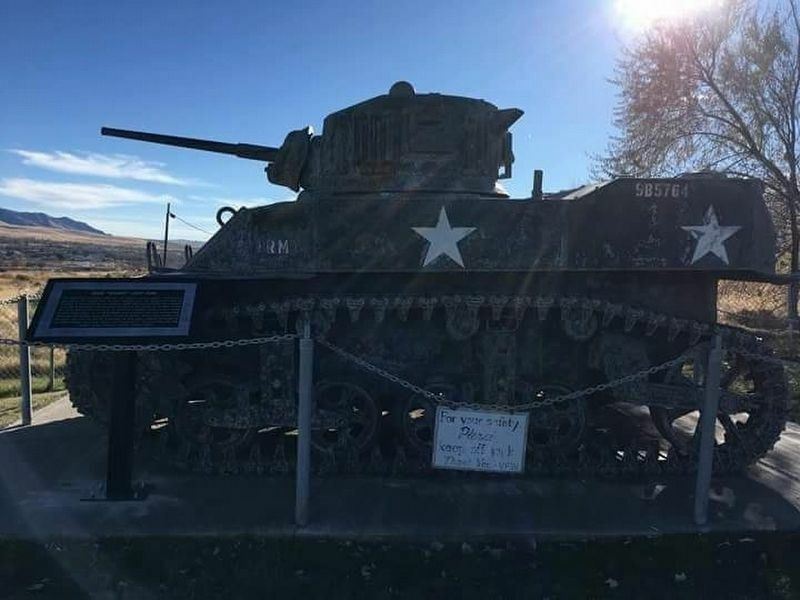 American M5/M5A1's were battle-tested in Tunesia, Sicily, Italy, France and Germany, but also the Pacific, especially as they were replaced in Europe by the M24 Chaffee light tank. Many were modified for special duties, like the "Zippo" flame-thrower variant, among others. Constructed as a F-86D-55-NA serial number 53-0568 by North American in 1953. This F86D was deployed with the United States Air Force in Germany. 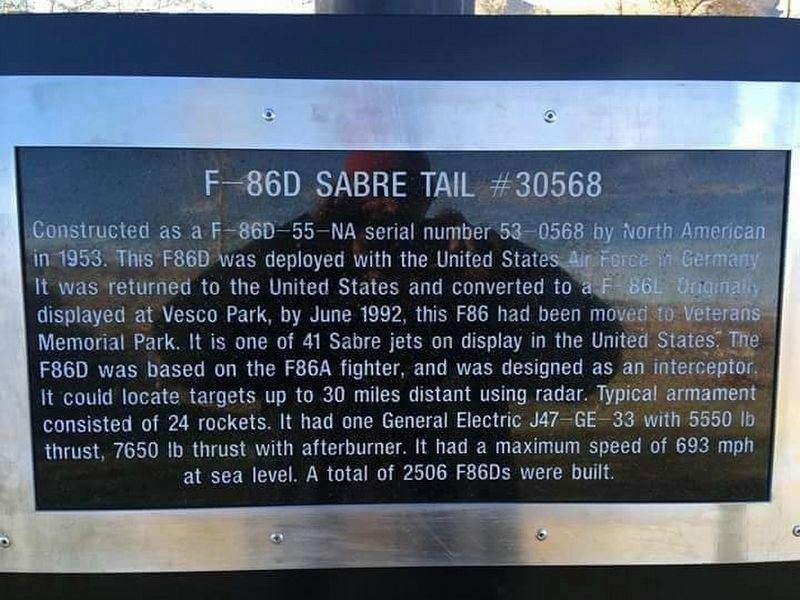 It was returned to the United States and converted to a F86L Originally displayed at Vesco Park, by June 1992, this F86 has been moved to Veterans Memorial Park. 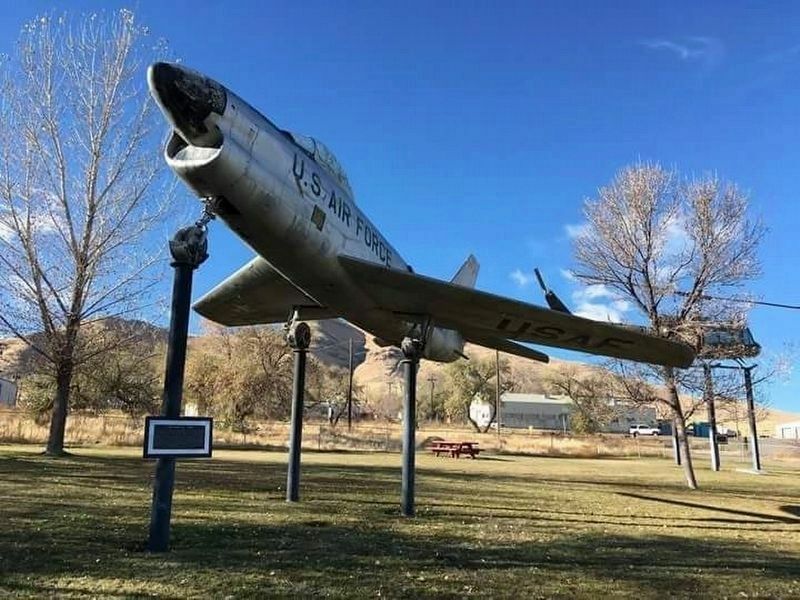 It is one of 41 Sabre jets on display in the United States. The F86D was based on the F86A fighter, and was designed as an interceptor. It could locate targets up to 30 miles distant using radar. Typical armament consisted of 24 rickets. It had one General Electric J27-GE-33 with 5550 lb thrust, 7650 lb thrust with afterburner. It had a maximum speed of 693 mph at sea level. A total of 2506 F86Ds were built. 8. 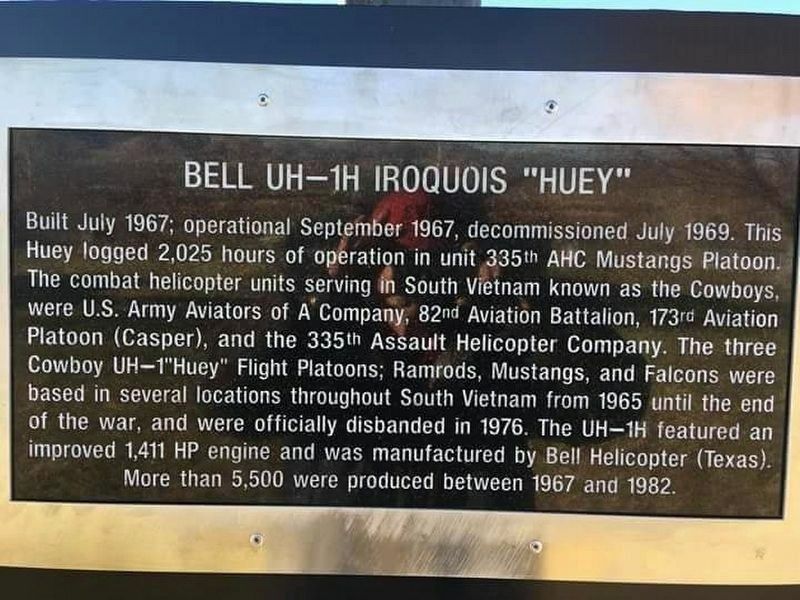 Bell UH-1H Iroquois "Huey"
Built July 1967; Operational September 1967, Decommissioned July 1969. 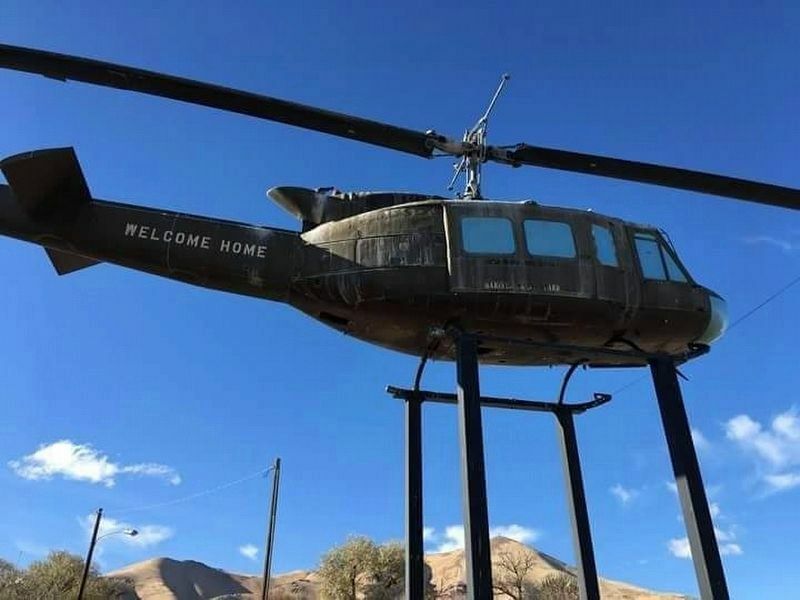 This Huey logged 2025 hours of operation in Unit 335th AHC Mustangs Platoon. The combat helicopter units serving in South Vietnam known as the Cowboys were U.S. Army aviators of A Company, 82d Aviation Battalion, 173d Aviation Platoon (Casper), and the 335th Assault Helicopter Company. The three Cowboy UH-1"Huey" flight platoons; Ramrods, Mustangs, and Falcons were based in several locations throughout South Vietnam from 1965 until the end of the war and was officially disbanded in 1976. The UH-1H featured an improved 1,411 hp engine and was manufactured by Bell Helicopter (Texas). More than 5,500 were produced between 1967 and 1982. 9. Bell UH-1H Iroquois "Huey"
The M60, also known unofficially as the M60 Patton, is a first-generation main battle tank (MBT) introduced in December 1960. 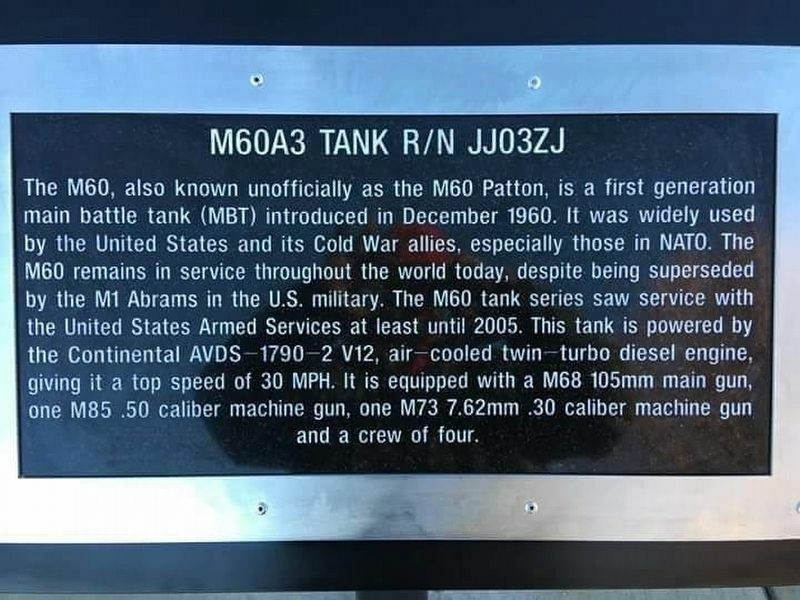 It was widely used by the US and its Cold War allies, especially those in NATO, and remains in service throughout the world today despite being superseded by the M1 Abrams in the US military. The M60 series saw service with the United States Armed Services at least until 2005. This tanks is powered by a Continental AVDS-1790-2 V12, air-cooled Twin-turbo diesel engine giving it a top speed of 30mph. It is equipped with a M68 105mm main gun, one M85 .50 caliber machine gun, one M73 7.62mm (.30 caliber) machine gun and a crew of four. More. 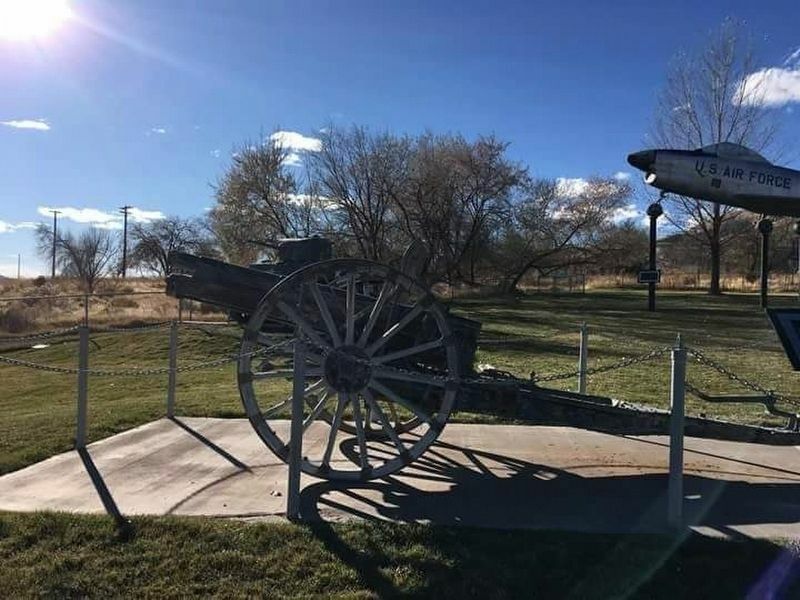 Search the internet for Veterans Memorial Park. Credits. This page was last revised on April 15, 2019. This page originally submitted on April 7, 2019, by Frank Gunshow Sanchez of Hollister, California. This page has been viewed 46 times since then. Photos: 1, 2, 3, 4, 5. submitted on April 7, 2019. 6, 7, 8. submitted on April 10, 2019. 9, 10, 11. submitted on April 14, 2019. • Andrew Ruppenstein was the editor who published this page.